At a time when most magazines consist of predictable articles by predictable people, The Oldie dares to give you something different. 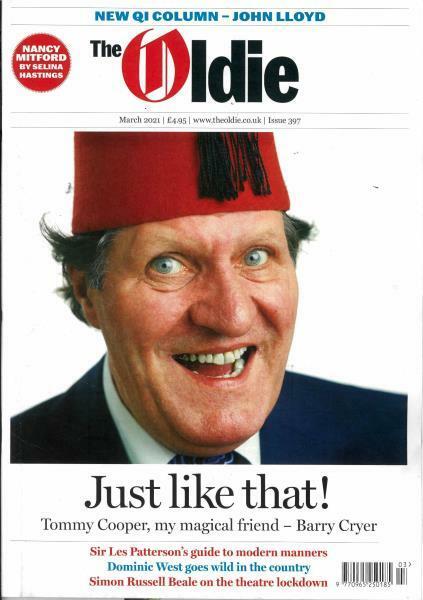 Founded by ex-Private Eye man Richard Ingrams, The Oldie is emphatically not a magazine about retirement. We recognise that what our readers want more than anything else is good writing and amusing articles on a wide variety of topics. It is for any independent-minded reader. Every month it brings you great writers such as Mavis Nicholson, Raymond Briggs, Ruth Rendell and Tom Stuttaford. As well as these and other equally famous and talented guests, there are contributions from people of whom you will not have heard. It is this unsolicited material - one reader's role in the sinking of the Scharnhorst, or the recounting of a chance meeting with Chuck Berry on a train - that makes it unique. Probably one of the best magazines ever. The Oldie has cult status: you might be reluctant to subscribe (and admit that you are an Oldie yourself) but once you’ve crossed the line, you won’t look back. The monthly magazine has an enviable stable of writers, who are all very much alive and kicking. The magazine has acerbic wit and a good sense of fun. It won’t tell you how to while away your afternoons bathed in the golden aura of memories of an earlier age. Instead it will inject vigour as it pokes fun at much of the triviality of living today and our obsession with celebrity. With lines such as ‘Buy it before you snuff it’ and ‘Everyone buys it eventually’, you quickly get the magazine’s drift. As PD James put it, ‘The Oldie is an indispensable antidote to the triviality of the 21st Century.’ The Oldie has been keeping the provinces chuckling for years. Long may it continue. Richard Ingrams, who had been editor of Private Eye for 23 years, launched the Oldie in 1992. The Oldie was a natural progression for Ingrams and his colleagues. Contributors include Dr. Thomas Stuttaford writing on health, Candida Lycett Green on unspoilt corners of the British Isles, Beryl Bainbridge on theatre, Alice Thomas Ellis on religion, Deborah Kellaway on gardening. Miles Kington writes regularly giving his spin on life, whilst Ned Sherrin keeps an eye out at memorial services. The I Once Met column is written by readers on their reminiscences of meeting the famous. You can read some articles online or download a sample copy of the magazine in PDF format. You can buy subscriptions online. There is nothing sleepy about The Oldie: there is an active events programme with monthly literary lunches held at Simpsons-in-the-Strand, garden tours visiting gardens not normally open to the public and the occasional regional event. The Oldie of the Year Awards attract attention from the media. Over 100 celebrity oldies, politicians and writers gather to celebrate and recognise oldie spirit. Last year Sir Ranulph Fiennes won Oldie of the Year for running seven marathons across seven continents.